Authored by Campbell Barton (campbellbarton) on Apr 11 2014, 6:30 AM. "Like" token, awarded by Alphisto. "Love" token, awarded by nirenyang. "Love" token, awarded by leon_cheung. "Like" token, awarded by gandalf3. This is a long requested feature, however currently the color is already used for group, selection and object types. 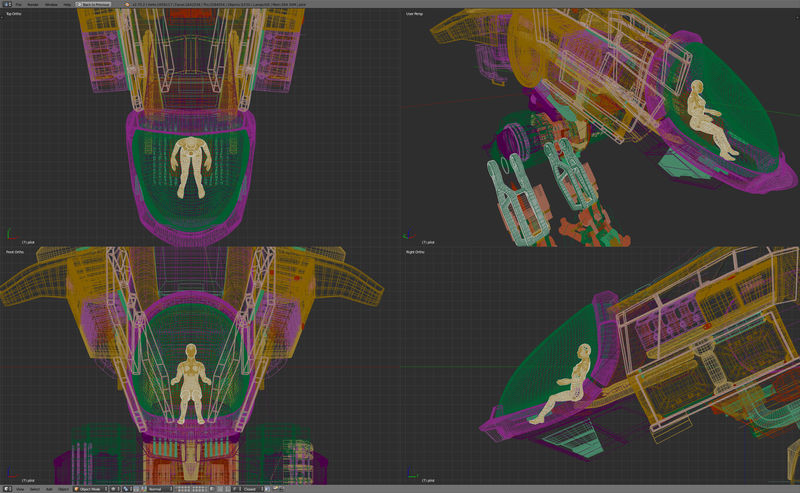 So this is an attempt to add the ability to show colored wireframe without interfering with existing display options. Color wireframe is an option which applies to wire and bounding box draw modes. When enabled, color from the object draw_color is used (a separate color setting). The background draws grey (so themes don't interfere with user-specified colors), Overlay guides draw black (cursor cross-hair for example). Selection state is shown by a white wire-outline. Active objects draw a brighter outline. In certain cases this is a very useful feature, but it conflicts with other features too much, so this works like Matcaps, optionally changing the draw mode for all objects. Adding a section for this, since it seems to be one of the more controversial topics. This is a problem if someone else tries to use their file, so. I've opted to hard-code the background color when custom wireframes are enabled. See image below. Now stipple can work like color, it can be set by the caller of draw_object without having to worry about it changing. Would it make sense to restrict user colour selection to hue only? 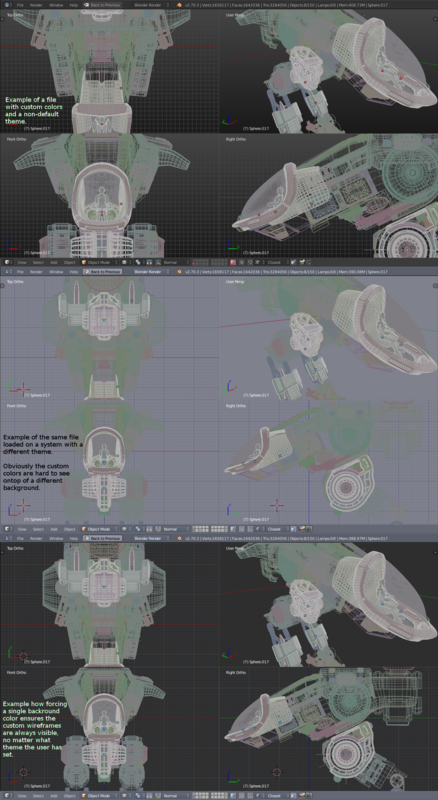 That way Blender can still use value/saturation to indicate selectedness/activeness. Been waiting for this for a long time. Thank you. I like the stippled lines (reminds me of Multigen). How hard will it be to get the depth buffer (hidden line removal?) working? The bottom row are all selected. Selected objects are drawn in white apart from the last selected which is drawn in bright green. 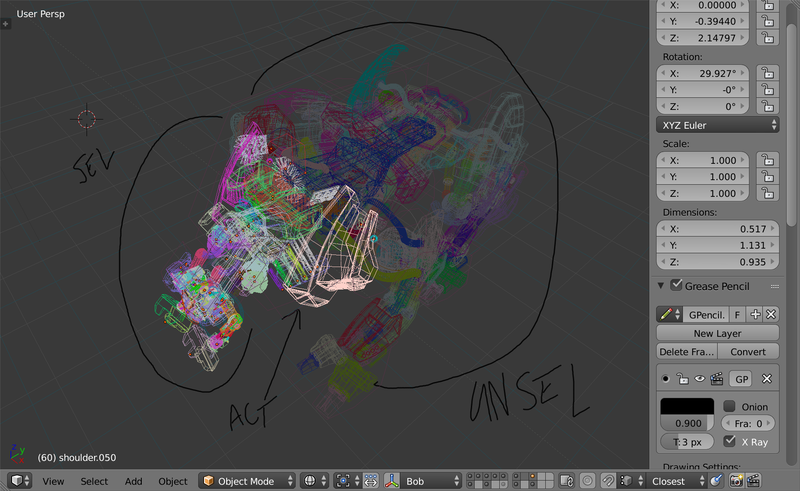 If memory serves you can customise Maya wireframes colours even if they break the guideline/defaults. Colored wire now uses depth buffer, fixed issue in drawing stipple selection and correctly set dflag for set-scenes. I've been wanting this for a long while, thanks for working on it! :) I've had some thoughts about how this could be implemented - though it seems you have this under control. I think the main reason people want this feature is to allow them to distinguish key objects visually in wireframe mode (eg. make character A green, character B red and animated props blue...), or make unimportant objects less visible (eg. background set objects a dull grey). Users know that there will be issues like wireframe colours being too similar to the viewport background. The best design here imo is a simple and predictable one. Let them make whatever colours they like, and don't try to handle cases where the wire is not so visible relative to the background - that's the user's problem that they would rather solve themselves than have limitations like only being allowed to adjust hue and saturation, or being forced to have a specific background colour. The reason I think that's ok is because whoever builds the model and assigns the wireframe colours (which should definitely be separate from the object colour) is probably the guy who will be using it - or works with the guy who will be using it. Thus he knows what theme(s) will be used and will choose colours that don't contest with the theme. As for selection, the stippled line is a pretty cool idea, but perhaps not suitable for selection. It might be nice to have this as an option for each object (eg. make rig controls solid wires and character mesh wires stippled). Having thicker wires might be a good solution for selection, but I think just overriding the colours would be best - selected and active object wires stay defined by the theme. Custom: A custom colour for the unselected group, selected and active wire colour would be the same as non-group objects. Attached a patch which testes outline to show active & selected, rather then dashed line. This has the advantage that you can tell active from other selected objects. But the disadvantage that zoomed out, you can't see the color quite as well (selection overlay becomes a bit too heavy). improved method of drawing wire overlay. The selection overlay would glow too much, making it hard to see the color. The patch now uses a light outline rather then an overlay. clear the depth buffer when drawing the selection, so selected objects are always ontop. minor tweaks to this patch to use wire color in solid mode. As one who attempted coloured wireframe a couple of years ago, I had setup a per object colour for wireframe with group,select,active etc colours overriding the object wirecolour. I put off my next idea as bmesh was going in and never got back to it. Something Ton said on IRC about how he wanted it to work gave me the idea to create WireColour sets - similar to bone group colour sets. Each set would define a wire, selected and active colour with group and edit colours being global colours overriding the colour set. Then each object can choose to use a set or default to the theme colours. I had thought of the colour sets being a list at the scene level, as a user generated list rather than a preset fixed list like bone groups. Maybe the factory startup.blend could have a preset list of sets defined. About background.. the custom background there should be such option. to use the same background with is used in them with u have created. Why i have to use gray background because it is the best compromise, + it will work with all color setups in blend. Who cares?! if i open a blend from someone and he has some colors with dosn't work with my background i spend 1-2 minutes to just change them so they work... or i just Click a checkbox button with change the background to black or gray or whatever default..
Groups will be possible to have custom groups colors? The request and ideas put here or on the BA forum? so i got idea.. would be possible to make Overal Saturation/Brightnes of wire frame. let' say that u have some almost 100% red blue etc.. very contrast colors.. and u want to make them more.. eye pain.. u just turn down the saturation.. or u have white background? and the colors are to dark? u just turn more brightness... That simple stuff would make even more easly adjusting someone else blend or even your blend to your background. 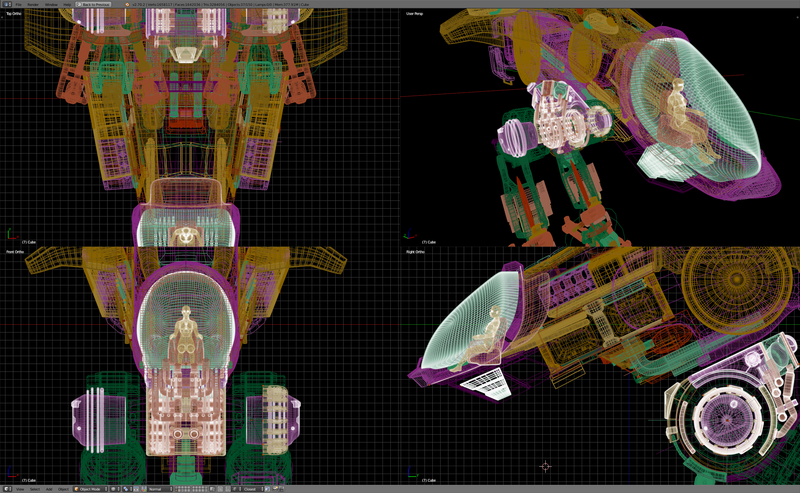 -auto random wireframes on object creation. -global turn on/off all colored wireframes to default theme. Can somebody post a win 7 64 build of the patch? it seems that the one in graphicall from tungerz is not working properly in my system. wire color is now a separate setting. Fix for dupli-objects (which now follow the wire color). Minor changes to python UI (no longer cram color next to object name). Abandoning, this patch applies to 2.71 release and may be useful as a reference in its current form. A quick patch to see wire colored wire in solid mode, Note that this is using solid drawing but overriding the material color with the object color. - click link for screenshot. Users can select any color they want. Colors are adjusted if they are too closely matching the background color. (so as to avoid conflicting with themes and no need to override background color). Color wire is also a viewport option (default on), but can be disabled. This way, you can op-out of viewing colors if you load someone elses file and they are getting in the way. To toggle entirely, change the color-wire option in the view display panel. 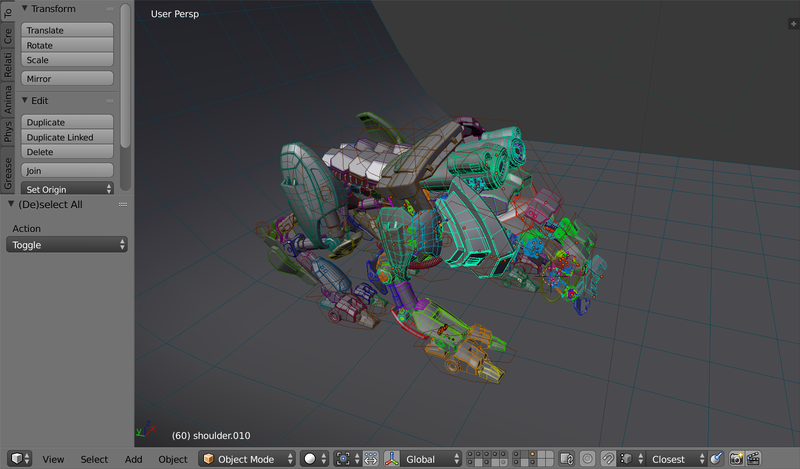 Screenshot of the mango-quadbot. - random colors, ideally we have a better way to set colors. -	/* multiply view with object matrix. +	/* multiply view with object matrix. Abandoning this specific patch. since the feature's in gooseberry branch now. Adam Preisler (Alphisto) rescinded a token. Adam Preisler (Alphisto) awarded a token. Adam Preisler (Alphisto) added a subscriber: Adam Preisler (Alphisto).